I love Mark Bittman. His recipes are always straight-forward and just work. I’m so glad he’s blogging for the New York Times – you can never have enough Bittman. A while back he did a piece on the perfect pancake. Four different fool-proof versions to try. I love the fluffy rendition that features ricotta. 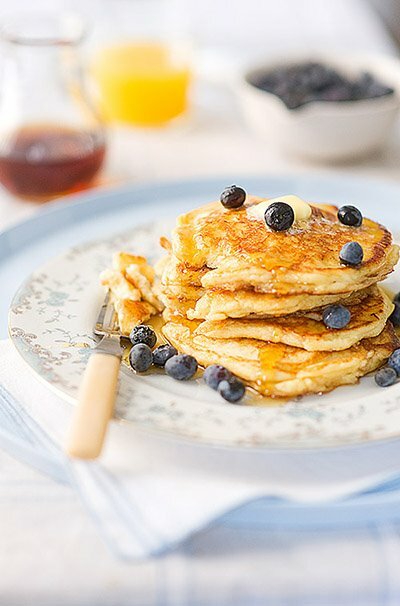 He’s right – why do so many people buy pancake mix when it’s almost as quick to whip up your own batch? I don't know why anyone would want to buy pancake mix either, when the best pancakes (like yours) are always homemade! I prefer making homemade pancakes to any storebought mixes. I always add ricotta to my pancakes because it gives it a great flavor. Sabra, these look gorgeous! I've also used cottage cheese in the batter before. Delicious & filling! If that isn't a perfect breakfast, I don't know what is. amazing photo, as usual. i usually use gluten-free flour to make pancakes for they make crusty 'skin'. but using self-rising flour i think can be enjoyable as well that will give smoother and softer texture. love it for brunch! Can vouch first hand that your pancakes are stellar. MMMM! Great photo. there's something for you at jugalbandi. congratulations!!! i've made pancakes with ricotta before and i agreed, it's fluffier than regular pancake recipe. thumbs up for Mark Bittman! The man knows how it's done. I've never understood the pancake mix thing either. I've tried ricotta pancakes before, and they are crazy good, especially with a little orange zest. Mark Bittman is great, and you should probably be doing his photography for him! hi, new to ur blog. just wanna say ur photos are great. i like this pancake one as well. ive tried to make it with cottage cheese too. its good. im gonna try these ricotta ones. btw, may i ask, what camera ur using for ur photos? they turn out great. do put them in raw? Thanks for all of the pancake enthusiasm guys!!!! I love the idea of cottage cheese - I'll have to try that too. Arfi - gluten-free, huh? Never heard that trick - will definitely check that out! Re: cameras, etc., - if you hop over to flickr (link on the right) you will see all of my camera data loads for each photo. These look great. I like Bittman, too, though I did NOT have success with his most recent recipe for quick whole wheat no-knead bread. Your pancakes look delicious, though!